Not every eyeglass lens is made the same. Here at Dr. Shah & Dr. Frohn Optometry, we carry the latest computer generated eyeglass lens options with lenses from Varilux, Transitions, Crizal etc. Our wide selection of lens options ensures that we can provide you with the right solution for your prescription, lifestyle, and budget. So, whether you are looking for progressives, bi-focals, light sensitive photochromic, scratch and dirt resistant, anti-glare, polycarbonate, ultra lightweight high-index, or lenses designed for special conditions - like working at a computer or workstation all day, we have something for you. 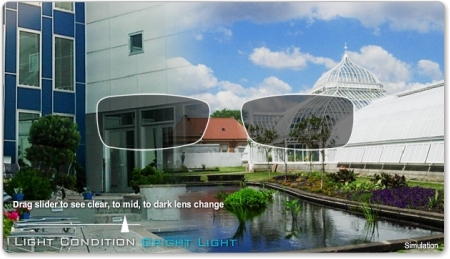 ​Why do you need a Progressive Lens? ​This solution solves the problem for near vision however the mid-range and distance vision become blurry while wearing the reading glasses. Bifocals allow you to see distance and near clearly, however the mid-range remains blurry. There is also a very abrupt split in your vision rather than a natural progression. And let's not forget the visible, unsightly line. Progressive lenses (also referred to as no-line bifocals) allow you to see distance, mid-range and near clearly. The transition between the three ranges is a natural progression without sudden shifts in vision. As a result, you only need one pair of general-use glasses. This solution offers you the best option and is the closest to your natural vision, regardless of the distance. You get clear, comfortable vision at all distances. Why should you consider Varilux and Essilor Premium Progressive Lenses as your "Progressive Lens of Choice"? With standard progressive lenses, distance, intermediate and near vision is clear however the corridor of vision is very narrow and there is a great deal of peripheral distortion which can make you lose focus or get dizzy. Varilux and Essilor Products are Premium Progressive Lenses which eliminate these problems. Using the highest index of refraction, most advanced material, Hi-Index lenses that are thinner and lighter than they have ever been before. High prescriptions no longer mean thick, chunky lenses that can only be glazed into heavy frames. Hi-Index stands above ordinary glass and plastic lenses. Thanks to the Crizal anti-glare lens enhancements and Transitions enhancements, that can be an added feature of Hi-Index lenses, a more natural vision that is clearer, sharper and easier on the eye can by enjoyed. UltraThin UV 1.67 lenses are up to 60% thinner than regular plastic lenses. Advanced lens technology that combines superior optical performance with a thin, flattering look. 1.67 Hi-Index lenses shield your eyes from 100% of the sun's harmful UV rays. ​Polycarbonate lenses (a.k.a. feather weight lenses) are the most-used alternative material for modern ophthalmic lenses. These lenses are thinner than conventional plastic lenses and impact resistent. Impact Resistant - Polycarbonate lenses are 10 times more impact resistant than plastic lenses. Lighter - Polycarbonate lenses are up to 35% lighter and thinner than standard plastic lenses for greater comfort. UV Protection - Polycarbonate lenses shield your eyes from virtually 100% of the sun's harmful UV rays. Scratch Resistant - PolyCarbonate lenses are hardcoated for excellent durability and scratch resistance. Regular lenses transmit only about 91% of light to the eye. The rest is lost to front and back surface reflections. However, a revolutionary coating developed to reduce reflections from camera lenses is now available for eyeglass lenses. For Driving: Crizal Anti-reflective coatings provide you with improved safety and faster recognition of potential hazards on the road, especially at night. The reflections of streetlamps and headlights on your lenses are virtually eliminated. For Working: Artificial light in an office environment quickly leads to eye fatigue and working on the computer puts a strain on the eyes. It is particularly important to use Crizal anti-reflective coatings to protect your eyes while working. For Appearance: Choose Crizal anti-reflective coatings to improve transparency and cut down on reflections others see in your glasses. You'll enjoy direct eye contact, unhindered by distracting reflections! For Durability: Crizal Anti-reflective coatings enhance the quality and expand the lifetime of your lenses by providing superior scratch resistance, durability and resistance to dirt and water. Shouldn't you see outdoors as well as you see indoors? If you're not wearing polarized sun lenses, you're not. ​Only polarized sun lenses reduce the glare that impairs your vision, so you can see your best in the brightest conditions. We all love spending time in the sun. But it's important to protect your eyes against the sun's damaging UVA/UVB rays, which over time can cause cataracts, macular degenerations and skin cancer. Children who spend a lot of time outdoors are especially vulnerable. Wearing polarized sun lenses year-round will provide 100% protection from these sunrays, which can damage your sight. Transitions Lenses change from clear to dark in the presence of ultraviolet light and block 100% of harmful UV rays. This innovative photochromic technology has produced unparalleled eyewear performance. Transitions Lenses are compatible with bifocals, trifocals, progressives, shatter-resistant and standard lenses, and hi index materials. It's never too early to start caring for your children's eyes. Children are excellent candidates for Transitions Lenses because their eyes are more susceptible to UV radiation since they are continuing to develop. It is estimated that 80% of total lifetime exposure to UV rays occurs before the age of 18. Transitions Lenses block 100% of harmful UV radiation. Certain people develop a heightened sensitivity to light, known as photosensitivity, and are more susceptible to visible light. Photosensitivity can develop with conditions such as diabetes or recent eye surgery. The condition can also be caused by taking certain prescription medications. Some medications, even those used to treat conditions not related to vision, can also cause the eyes to become more susceptible to damage from invisible UV rays. Patients with special needs are excellent candidates for Transitions Lenses. Our unique eyeglasses frame selection is unlike any other optical in the area. We recommend eyeglasses based on your individual face shape, brow line and overall tone along with your needs and wants. ​We hand-pick every frame so that you can always choose from the latest styles and top colors. ​Our opticians are trained to customize your selection to fit your optical needs and specialize in "hard to fit" cases. ​Each pair of eyeglasses requires custom adjustments. So before you leave our office with your eyeglasses, you will be properly fit by an optician. ​We exclusively work with Varilux, Crizal, and Transitions. NO SUBSTITUTIONS like other retailers. ​Our on-site laboratory often allows us to make your eyeglasses within 48 hours of you picking them out (basic, single vision prescriptions only). ​We offer custom sport and hobby eyewear ranging from eyeglass frames for golf, motorcycling, swimming, kid's sports all the way as specialized as scuba diving. ​When you walk in you are greeted with a warm welcome and a smile. Our friendly atmosphere always keeps our patients coming back whether it's for an adjustment, to purchase an additional pair of eyeglasses or just a hello. We are open Saturdays which allows our patients to come pick up glasses without missing work. ​When we decided which frame lines to carry, we picked them based on quality and exclusivity. All of our eyeglasses come with a minimum of a one year warranty. ​BEST EYE EXAM of your life.